The Fluke 179 is the top model of the 170 Series of Fluke multimeters, noted for its high level of accuracy and extra functions. A True RMS DMM perfectly suited to troubleshooting in industry and around the home, this is one of the best general purpose meters available today and it comes with a lifetime warranty. With a fine build quality and input protection, plus all the ranges you would need to perform most measurements, it runs admirably in most situations, especially in electrically noisy environments. It has a sharp, 6,000-count display, 0.09% basic DC voltage accuracy, a useful temperature range and CAT-IV rating. As this is a True RMS multimeter, you can measure obscure waveforms pretty accurately, such as those produced by inverters and other AC variable drive systems. This is not possible with a run-of-the-mill ‘average responding’ meter, where you could have a discrepancy of 10% or more when testing the above scenario. In fact, the 179 is well geared to working with motors and drives, with its smoothing mode taking care of noisy signals and Min/Max mode for recording changing values. Fast responding auto-ranging provides quick results, and you can also switch to manual ranging and select your own range. Although you don’t have the functionality of the likes of the 87V or top of the range Agilents, all ranges on the 179 are quite generous, including voltage, which runs from millivolts up to 1000V. Temperature goes up to 400°C. See below for a brief comparison between the Fluke 179 and 87V. Accuracy and recalibration: Accuracy is typically as stated on Fluke multimeters and the above figures should be good for a year from purchase, or after recalibration. This meter can be ‘closed case’ calibrated, meaning it can be recalibrated via the panel as opposed to opening the case up and adjusting potentiometers. The Fluke 179 receives good feedback for its display. Although middle of the road – 6,000-count (or 3 5/6 digit) – it is very sharp and has an excellent backlight. The 33-segment bar graph underneath is super-fast, updating 40 per/s, so erratic signals can be observed in real-time. The display clearly shows the range you’re in as well as displaying useful icons, such as low battery and over-voltage. Together with a nice screen is a smooth-looking façade with a recessed dial that is protected in drops and is easy to operate. An integrated rubber holster provides further protection, though it cannot be removed as with most other devices. The kickstand is built into the holster and is quite sturdy on a bench. Probe holders are also part of the holster. 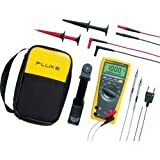 The Fluke 179 is a Made-in-the-USA model, and, because of this and the excellent specs, it is sold with a limited lifetime warranty. Just to clear that up as some Flukes are today put together in China; namely the 110 series and other, more budget-conscious models. The IEC safety rating on the Fluke 179 is Category 3 up to 1000V and Category 4 up to 600V. This means that it can safely withstand 8kV transients, such as surges from large motors and lightning strikes. It will achieve this without exploding into a thousand pieces, which is what some cheap meters tend to do when faced with large surges. The 179 is also protected with high rupture-type fuses (440mA and 11A) on the current inputs and has a probe lead alert system should you plug into the wrong input. Barring no micro-amps, there are few cons, but it would be nice to at least get a case thrown in. With the Fluke 179 review, we have the best meter of the 170 series. It vies with the great 87V, although is without micro-amps, so is not so useful for HVAC work and electronics. It’s very accurate, nonetheless, and also comes with a pretty good temperature range. Alternatives: If you don’t need temperature, the 177 has everything this does bar a temperature range. Alternatively, the much cheaper Fluke 117 is a good deal, only losing out on milliamps, though can’t compare on accuracy and build quality.